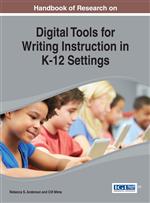 In this chapter, the authors seek to help educators understand trends in students' writing outside of the classroom, with a particular emphasis on illuminating students' purposes and practices in writing within social media spaces. The authors synthesize current research on students' Internet and social media practices and offer a case study from their own research on students' writing within an educational Facebook application called Hot Dish. This chapter seeks to elucidate the reciprocal relationship between students out of school writing using popular social media and their in-school practices. Ultimately, the authors seek to help readers make connections between what students are doing with new media in their leisure time and the improvement of students' writing performance in K-12 settings, believing there may be important but under-explored synergies. The New York Times recently headlined a story that inquired: “If Twitter is a work necessity …” (Preston, 2012). The article argued that digital literacy is fast becoming a necessary skill as employers seek employees with social media savvy. Increasingly ubiquitous access to the Internet and social media in schools, homes, and communities makes new forms of reading and writing possible, and these influence educators’ desired competencies for learners and goals for learning, instruction, and future research (Greenhow, Robelia, & Hughes, 2009). Often used interchangeably with Web 2.0, the term social media refer to online applications that promote users, their interconnections, and user-generated content (Cormode & Krishnamurthy, 2008). Examples of social media are social network sites such as Facebook and LinkedIn®; video-sharing sites such as YouTube®; and microblogging sites such as Twitter. In the United States, two-thirds of online adults (Smith, 2011) and three-quarters of online teenagers (aged 12–17) use social media (Lenhart, Purcell, Smith, & Zickuhr, 2010). Indeed, online social networking is the dominant form of out-of-school, leisure time computer-using activity among American teenagers (Kaiser, 2005). New technologies such as … social networking technologies and video- and music-dissemination technologies have rapidly spread, by means of the Internet, each with additional, new literacy forms and functions that are reshaped by social practices... literacy has now come to mean a rapid and continuous process of change in ways in which we read, write, view, listen, compose, and communicate information (Coiro, Knobel, Lankshear & Leu, 2008, p. 5). As social media become significant and pervasive in most young people’s lives, and their relationship with these technologies no longer formed primarily within school but in the domain of popular culture, educators must move beyond conventional views of these media as curriculum-delivery devices, teaching aids or ‘‘neutral’’ tools for learning (Buckingham, 2007, p. viii) to find ways of engaging with them more creatively as ways of representing the world, of communicating, and as social and cultural processes (Buckingham, 2007; Greenhow & Robelia, 2009).